Ten years ago director Jonathan Nossiter created the documentary Mondovino, a detailed, thoughtful and occasionally fascinating look at what is basically corruption in the wine industry. 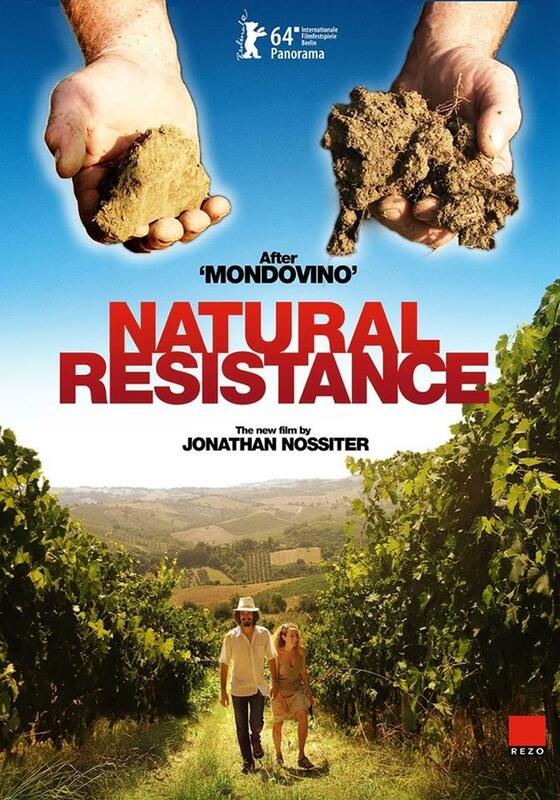 Natural Resistance essentially functions as a sequel, in which he follows four rebels of Italian winemaking and, for some reason, the owner of a cinema showing old films – not necessarily classics, just old films of varying nationality, genre, and era. The film hangs together about as well as the cinema’s programme of films. Nossiter, or his subjects, are trying to say something, certainly, about the relationship society has with its history. “If you forget your past, you have no future” – that sort of thing. To this end, clips from all sorts of films are sprinkled regularly, but nonsensically, through the film, which otherwise consists almost entirely of conversations with winemakers. These conversations aren’t always about wine, the politics of agriculture, or anything in particular, and they can become unforgivably boring – perhaps that’s why the film clips are here. The shoe-eating scene from The Gold Rush might be old hat – and I rolled my eyes when I recognised it – but it’s a damned good scene, and did a better job of holding my interest than anything else in the film. It’s hard to know what’s worse – the fact that a scene that might be going somewhere can be suddenly interrupted by a meandering public execution scene from (a little research tells me) the 1981 Italian comedy Il Marchese del Grillo, or that there are scenes so dull it’s actually a relief when Mussolini starts screaming at you through the screen. At least he holds your attention. Mussolini. I already found Monodovino to contain an awkwardly large amount of not-strictly-relevant discussion of Fascism. Here, there’s even more: after we’re treated to the conspiracy theory that governments are trying to destabilise farming, so that people eat processed junk, so they’re weak and obedient, there’s a sudden cut to some SS oppression. I’m not saying that the film, or its director, is Fascist, just that it’s offensively and distractingly bizarre, when a grape farmer explains grape breeding to you, to bring up the Holocaust, as happens elsewhere. It isn’t just the film’s strange outlook that bothered me, or the fact that the documentary feels exactly like four conversations cut up, stuck together, and padded to feature length with stock footage. It’s also that the camerawork is sub-home-movie level. This film is Nossiter’s sixth; he should – he must – know how to use a movie camera, but the frame is in such a constant state of movement you wonder if he wasn’t trying to liven things up the Bourne Identity/Quantum of Solace way: just shake it until you’re worried you’ve broken it, that’ll put some energy and movement into your film, won’t it? At one point the camera moves sideways into a hedge while one of the farmers is talking. Any camera that shakes this much and, for that matter, captures images of such low quality, must be a handheld, therefore Nossiter must have strafed, slowly and deliberately, into a hedge mid-conversation. But why? Is it a metaphor? Was he hiding? If you get an opportunity to see Mondovino, go ahead. It’s very, very slow, but in a pleasant way, and by its end you’ll want to stop buying wine from supermarkets altogether. By the end of Natural Resistance you’ll want that supermarket wine again, just out of spite. Oh, and since I might not get another excuse to bring up this joke of my uncle’s: why did the sommelier get the sack? He kept getting a Semillon. So what do you think about Natural Resistance? Let us know in the box below and be sure to visit Christian’s site Mediocre Batman!